There’s a Southern American tradition for the first day of the new year — eating black eyed peas, greens, and cornbread. The peas stand for coins, the greens for your green bills, a.k.a. cash, and the cornbread for gold. Throwing in some pork is beneficial, as the pig represents forward progress. Turn these all into a meal for prosperity throughout the new year. The day of black eyed pea dish is called, “Hoppin’ John.” Make sure to save the leftovers, for the following day, when you eat your “Skippin’ Jenny” and show your frugality, you’ll increase your chances for prosperity. As an added bonus, for those of you who party a bit too enthusiastically on New Year’s Eve, Hoppin’ John is a pretty good hangover meal. All of that protein and fat will make your uncomfortable tummy happy and settled. 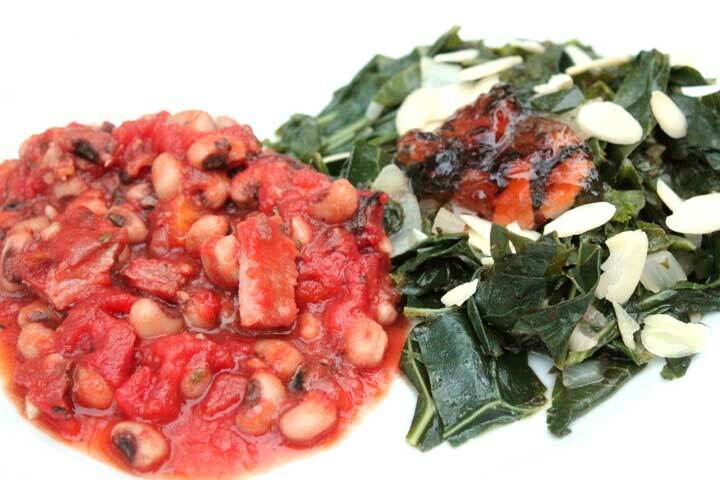 I make a spicy Hoppin’ John and collard greens for our first meal each New Year’s Day. I feel pretty darn blessed, and it’s a lovely meal, so why mess with tradition? I do, however, tweak the recipe just a tad each year, and I think I’m finally satisfied with the full-on meal. The flavors meld beautifully together, so much so, you’re going to be really looking forward to your Skippin’ Jenny. Soak peas overnight. On New Year’s Eve, drain peas and rinse, then put in a slow cooker. Cook bacon in a skillet until done. Remove bacon, but make sure to keep the grease. Chop bacon and add to cooker. Add garlic, tomatoes, hot sauce, nutmeg, salt, and parsley. Stir. Taste the sauce to see if anything more needs to be added — more hot sauce, salt, etc. Put the lid on the cooker and set to low right before heading to bed after the clock strikes midnight. The next morning, your Hoppin’ John will be ready to eat, but not until those greens are ready. As water heats up, rinse greens. Remove stems and chop leaves into one inch wide pieces. Place into boiling water and cook for fifteen minutes, stirring occasionally. Drain in a colander and squeeze out excess moisture with a towel. Warm up a skillet and add your reserved bacon fat. toss in the garlic and shallot and cook until the shallot turns clear. Add greens and sautee until greens are warmed through. Squeeze the lemon juice into the skillet, followed by the drizzle of vinegar and pinch of salt and toss well. Place greens on a plate, sprinkle with almonds, and add a dollop of jelly to the top. The sweet and spicy jelly compliments the bitter greens beautifully. Serve your Hoppin’ John and collard greens with cornbread, and your New Year’s Day is set, and hopefully, so is your year. While it may be too early for the Hoppin’ John, I’d recommend pairing a pale ale with your Skippin’ Jenny. We drink one of our favorites with the meal, Steelhead‘s Extra Pale Ale. We love us some Steely. P.S. Since I write about wine, you may be wondering what we’re drinking to toast in 2014. This year, we opted for a true Champagne from G.H. Mumm, though we were very tempted by the really, really good Sharffenberger Brut Rose. I’ll probably end up getting some to celebrate anyway because it’s so good. I’ll just save it for other momentous occasions, like a beautiful day or finishing an excellent book, etc. All of those great things deserve celebrations too, after all.